The Wizarding World of Harry Potter inside the Islands of Adventure Park at Universal Studios Orlando features many rides that bring the world to life to us simple muggles! You can visit Olivander’s Wand Shop to get your very own wand! However, you may have some difficulty getting the spells down. I’m still yet to figure out how to get the broom to magically sweep on its own or the dishes to wash themselves. Visit Honeydukes to pick up some sweets! Bertie Bott’s Every Flavor Jelly Beans, Chocolate Frogs, and many other sweets make their appearance. Just hope you don’t eat a booger flavored one! Save those for when your relatives come to visit! There is also the Three Broomsticks for dining. 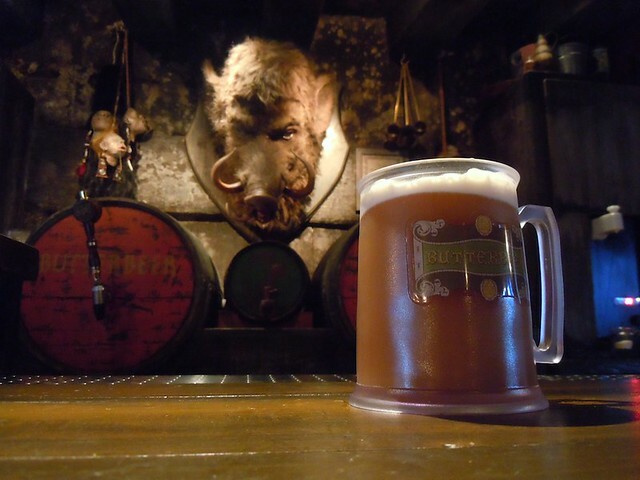 I always pick up a frozen butterbeer from the Hog’s Head pub located inside the restaurant. Butterbeer is served as a non-alcoholic drink and you can choose whether you would like it frozen or not. I personally like the frozen better! Don’t forget to grab a picture with the Hogwarts Express either! The train operator will be glad to pose with you for a picture. There have been rumors going around that we will eventually be able to ride the Hogwarts Express between the Islands of Adventure and Universal Studios parks! That will save a lot of walking and possibly time as Hogsmeade is located towards the back of the park, and we want you to see all the sights and get on all the rides!